The Walt Disney Company recently made its decision to enter the cruise industry official and has hired Arthur Rodney, President of Crystal Cruises, to head up the Disney cruise venture, tentatively named Disney Vacation Cruises. Rodney, who built up Crystal, will oversee all Disney cruise development and operations, including the design and construction of Disney's first ship. Also aboard is John Rusten as Director of Newbuildings (Project Development/Construction). Rusten comes from Kloster Cruise where he has overseen five newbuildings for Norwegian Cruise Line and Royal Viking Line. Rodney said he expected that a building contract would be signed by next March (1995) and that the first ship would be launched in 1998, with a second to follow soon after. Speculations here are that Disney will also consider building in the United States. Thus, among the potential builders is also Newport News. Meanwhile, Rodney's first task will be to get his management team together which he aims to accomplish during July and August. In a prepared statement, Disney Chairman Michael Eisner said "we are creating a distinctive Disney product, with recognized Disney quality and service." Disney plans to build big ships in the 70.000 to 80.000 ton range - accommodating approximately 2.400 passengers each - and custom-designed to the family market. Accommodations will include luxury staterooms, family suites and traditional staterooms. Disney underscored that shipboard activities featuring Disney characters will be designed to cater to all age-groups including adults. Ports of call will include an exclusive Disney private island experience for a day-long excursion. Disney cruises will be offered as part of a one­ week vacation, including three or four days at sea with the balance spent at Walt Disney World in Florida. Plans call for special transportation between Walt Disney World and the ships. According to Rodney, a homeport has not been selected and Port Canaveral, Miami and Tampa are potential homeports for the new Disney ships. Since plans call for an out-island, Port Canaveral or Miami would be most likely homeports. Port officials, however, do not foresee any special transportation being in place by 1998. That Disney is entering the cruise business is a boost to the industry and is expected to help elevate the awareness of cruising in the public image. Not surprisingly, the reaction from other cruise lines was positive. For the next three years, the existing cruise lines can be expected to benefit from the increasing awareness of cruising as a vacation form as Disney's publicity machine grinds into gear. Until 1998, Disney will have no cruise beds to fill. Even in 1998, Disney will be a one-ship cruise operator, with an annual passenger capacity of only 10 percent that of Royal Caribbean Cruise Line or Carnival Cruise Lines, and one third that of Premier Cruise Lines. So, in the larger industry picture, even with two ships, Disney stays a small operator for the rest of the decade. And, by linking cruises and stays at its resorts, Disney most likely will limit its engagement to Florida, Los Angeles, and in due course, possibly Japan, in the three- and four-day market. If the picture is narrowed to one or two ports, and with the focus on family cruises, Disney can be expected to become the marker leader in those ports. Factors leaning heavily in Disney's favor are the new ships, the Disney characters, and, of course, the overall Disney image. 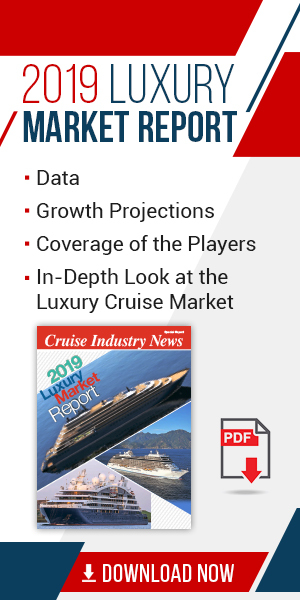 So, the big questton becomes what will happen to the smaller niche operators in the same markets, for example, American Family Cruises and Premier Cruise Lines? These companies could be disadvantaged by their older ships and relative lack of resources compared to Disney. On the other hand, continued market expansion further boosted by Disney's involvement, could generate enough passengers for all the so-called family cruise lines. While Disney's entry is considered a boost to the industry, the company is by no means guaranteed success. Other big-name American companies (Dial and Radisson) that have entered the cruise industry have so far only enjoyed modest success. Theme parks and entertainment do not necessarily translate into successful cruise line operations. And, while immensely successful, everything Disney touches does not automatically turn to gold, as evidenced by Euro­ Disney. Off the record, some cruise line executives also questioned the size of the family market or, as some put it, "how many couples without children would spend seven days with Mickey Mouse?" Other variables can be found in Washington, where proposed legislation, if passed, could in some cases force the cruise lines to homeport offshore. In that case, special transportation would be required. While it is assumed that Disney is continuing discussions with overseas yards, another interesting question would be if Disney, as an all-American company, would order a cruise ship to be built at an American yard? Disney officials would not comment, but sources close to Disney said that Newport News is interested and has the commitment and technology to build a cruise ship. Newport News has also been involved in refurbishment projects with Lloyd Werft Bremerhaven, which could supply the logistics and expertise required in addition to a network of European suppliers. A spokesperson for Newport News said that "we have a great interest in building cruise ships and we are doing some work now that will help us do that." The spokesperson also said the Newport News has been engaged in "preliminary" discussions with Disney. In the meantime, Scandinavian naval architects and designers have been at work on the Disney ship concept for some time. Regardless of the speculation, in Disney's favor already is the core of the new management team of Rodney and Rusten, both of whom have strong track records. While Rusten has seen five newbuldings through for Kloster, Rodney founded and built up Crystal Cruises, and before that, was President of Princess Cruises.